You can use API keys to restrict access to specific API methods or all methods in an API. This page describes how to restrict API access to those clients that have an API key and also shows how to create an API key. If you set an API key requirement in your API, requests to the protected method, class, or API are rejected unless they have a key generated in your project or within other projects belonging to developers with whom you have granted access to enable your API. The project that the API key was created in is not logged and is not added to the request header. You can, however, view the GCP project that a client is associated with on the Endpoints Services page, as described in Filter for a specific consumer project. For information on which GCP project an API key should be created in, see Sharing APIs protected by API key. # This method takes an Echo message. To turn off API key validation for an API or API method, remove api_key_required=True (Python) or apiKeyRequired = AnnotationBoolean.TRUE (Java) from your API or method decorator or annotation. Then recompile and re-deploy. where HOST and API_KEY are variables containing your API host name and API key, respectively. Replace echo with the name of your API, and v1 with the version of your API. Do you need to distinguish between the callers of your API so that you can use Endpoints features such as quotas? Do all the callers of your API have their own GCP projects? Do you need to set up different API key restrictions? You can use the following decision tree as a guide for deciding which GCP project the API key should be created in. After you have made a decision, see the sections below for more details. When you need to distinguish between callers of your API, and each caller has their own GCP project, you can grant users who are members of the calling projects permission to enable the API in their own GCP project. This way, users of your API can create their own API key for use with your API. For example, suppose your team has created an API for internal use by various client programs in your company, and each client program has their own GCP project. To distinguish between callers of your API, the API key for each caller must be created in a different GCP project. You can grant your coworkers permission to enable the API in the GCP project that the client program is associated with. In the GCP project in which your API is configured, grant each user the permission to enable your API. Contact the users, and let them know that they can enable your API in their own GCP project and create an API key. When you need to distinguish between callers of your API, and not all of the callers have GCP projects, you can create a separate GCP project and API key for each caller. Before creating the projects, give some thought to the project names so that you can easily identify the caller associated with the project. For example, suppose you have external customers of your API, and you have no idea how the client programs that call your API were created. Perhaps some of the clients use GCP services and have a GCP project, and perhaps some do not. 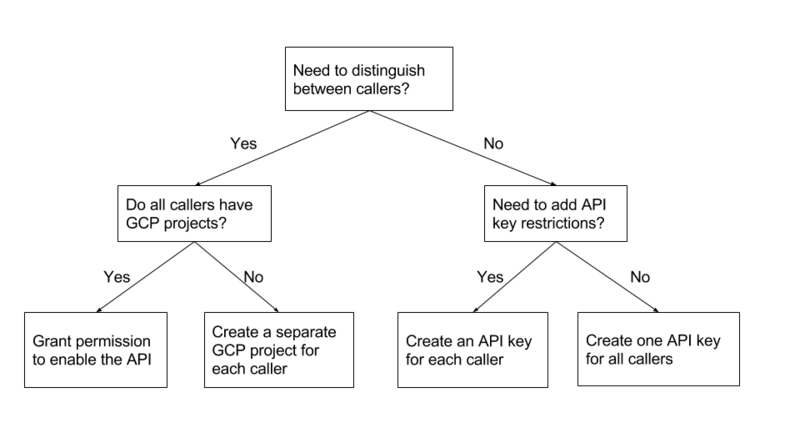 To distinguish between the callers, you must create a separate GCP project and API key for each caller. Create a separate project for each caller. In each project, enable your API and create an API key. Give the API key to each caller. When you do not need to distinguish between callers of your API, but you want to add API key restrictions, you can create a separate API key for each caller in the same project. In either the project that your API is configured in, or a project that your API is enabled in, create an API key for each customer that has the API key restrictions that you need. When you do not need to distinguish between callers of your API, and you do not need to add API restrictions, but you still want to require an API key (to prevent anonymous access, for example), you can create one API key for all callers to use. In either the project that your API is configured in, or a project that your API is enabled in, create an API key for all caller. Give the same API key to every caller.